Review by AllTheBestFights.com: 2015-06-13, disappointing fight between Henry Cejudo and Chico Camus: it gets two stars. The 2008 Olympic gold medalist in freestyle wrestling Henry Cejudo entered this fight with a perfect mma record of 8-0-0 (50% finishing rate) and he is ranked as the No.8 flyweight in the world (currently the #1 in this division is Demetrious Johnson); he has already fought once in 2015 beating Chris Cariaso (=Cariaso vs Cejudo). His opponent, Chico Camus, has a record of 14-5-0 (50% finishing rate) and he entered as the No.12 in the same weight class. He suffered his last loss in 2014 when he faced Chris Holdsworth, after this bout he came back to win beating Brad Pickett (=Pickett vs Camus). 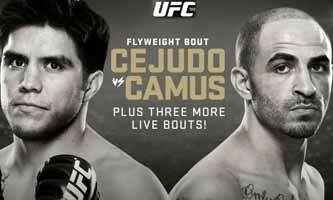 Cejudo vs Camus is on the undercard of Cain Velasquez vs Fabricio Werdum – UFC 188. Watch the video and rate this fight!